America in the 1960s was going through a “cultural awareness” era when the rules of equality were being redefined. The 1960 Olympic Games was a great opportunity to show the world what “equal opportunity” could produce. Since the heralded Jesse Owens had captured international fame in the 1936 Olympics, African American athletes- men and women- have been a dominant part of the games on every level. There have been plenty of “wow” moments in history, and one of the greatest showings was at the 1960 Olympics in Rome , Italy. Jeff Farrell won two gold medals in swimming. And a 18-year old Cassius Clay (aka Muhammad Ali) captured the gold medal in the light heavy weight division. Ed Temple, Tennessee State's famous women's head coach was selected to lead the U.S. Olympic Team, and he brought along four of the best sprinters in the country. It caused a buzz at the stadium as this was the first time that all four 4X100 team members came from one school. Wilma Rudolph put on the performance of a lifetime as she won three Olympic gold medals. Rudolph ran the 100m dash in 11 seconds flat (what would have a world record had it not been declared wind-aided). She ran the 200m dash in 23.2 seconds, setting another Olympic record. 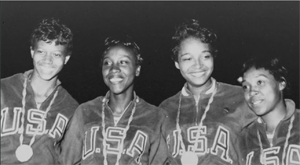 They astounded the 80,000 spectators as Wilma Rudolph combined with Martha Hudson,Lucinda Williams and Barbara Jones to set a new world record – 44.5 seconds in the 4X100 Relay event. At the end of the day, Wilma Rudolph had earned the title of "the fastest woman in history"